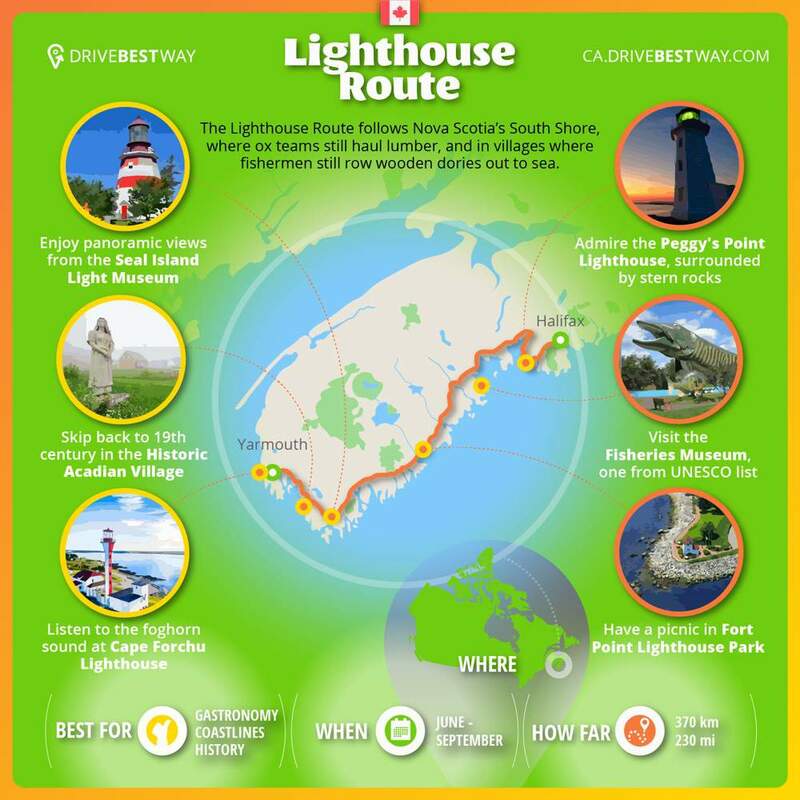 This infographics shows Lighthouse Route road trip, one of the top in Canada. Here are a several sights that definitely worth visiting on it: The Cape Forchu lighthouse, on a headland at the south western tip of Nova Scotia, is nestled into jagged rocks and offers a breath-taking natural vista. Today, it’s a great picnic spot on 19 acres which include beautifully landscaped grounds, a museum and fog alarm building. Peggy's Point Lighthouse is one of Nova Scotia’s most well-known lighthouses and may be the most photographed in Canada. The breath-taking Lunenburg waterfront is the home of the world-class Fisheries Museum of the Atlantic, a UNESCO World Heritage Site. The entire family will enjoy living fish exhibit and wharf-side vessels. The route is suited to you if you like gastronomy, coastlines and history. Take at least 2 days to pass it from June to September.